The NRL Grand Final, which determines the Australian rugby league football season's premiers, is one of Australia's major sporting events and one of the largest attended club championship events in the world. Since 1999 it has been contested at Sydney's Stadium Australia, which was the primary athletics venue for the 2000 Olympic Games. The first year it was held at Stadium Australia, the National Rugby League grand final broke the record for attendance at an Australian rugby league game, with 107,999 people attending. The grand final had traditionally been played on Sunday after the pubs closed,the following year saw the game shifted to an evening start. From 2008, a compromise was reached between official broadcaster Nine Network's preferred starting time of 7 pm and the traditional starting time of 3 pm, with the grand final beginning at 5 pm AEDT. In 2013 the evening start resumed, the match commencing at 7:15 pm. First grade rugby league in NSW began in 1908, the first premiership deciding game was played at the Royal Agricultural Society Showground, with Souths defeating Easts 14-12. From 1912 to 1925, no finals system was in place, however in 1916, 1922, 1923 and 1924, a match was played as a tiebreaker to decide the season's premiership winner. From 1926 to 1953, finals were played under the Argus system, which produced a deciding game in two slightly differing ways. All of these deciding games are now deemed to be grand finals, whether they were referred to as such at the time or not. From 1954 to the present, using a variety of systems, the deciding match has been explicitly termed a grand final, and no distinction is made between grand finals played under the auspices of the various governing bodies. The NRL grand final is held in Sydney since it has the most clubs in the NRL and the current venue for the grand final, Stadium Australia is the second highest capacity stadium in Australia, after the Melbourne Cricket Ground. The winners of the grand final qualify to play the winners of the Super League Grand Final in the World Club Challenge. The runners up qualify to play the Super League minor premiership winners in the second game of the World Club Series. The Clive Churchill Medal has been awarded ever since the 1986 NSWRL season when its first recipient was Parramatta's Peter Sterling. The only two players to have won the award more than once are Canberra's Bradley Clyde (1989 and 1991) and Melbourne Storm's Billy Slater (2009 and 2017). In 2010, the Melbourne Storm were stripped of the 2007 and 2009 premierships due to salary cap breaches exposed by the NRL, however the Clive Churchill Medallists from those years still continue to be recognised. The NRL present premiership rings for the players and coach of grand final winning sides. After the 2004 NRL Grand Final which was won by the Bulldogs, one of their players, Johnathan Thurston gave his premiership ring to teammate Steve Price who missed the decider due to injury. The Melbourne Storm were stripped of their premierships in 2007 and 2009, but the players involved in those premierships were still allowed to keep their premiership rings. In 2014 NRL premiership ring was worth $8000 made by Zed N Zed Jewellery. 1909 - South Sydney win the premiership by forfeit over Balmain. There was an agreement that both sides would forfeit the match, however Souths showed up, kicked off to an imaginary opponent, scored a try and were declared premiers. 1956 - St. George beat Balmain to claim the first of a world record 11 straight premierships. 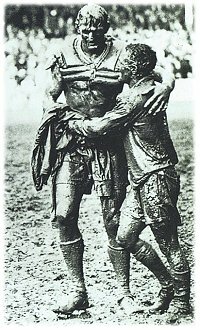 1963 - St. George beat Western Suburbs 8-3 in a match famous for the iconic 'Gladiators' photo of Norm Provan and Arthur Summons covered in mud. It is also notable for a controversial try scored by Dragons winger Johnny King. Wests players tackled him and believed him to be held, however the referee rules play on. 1965 - A then record crowd of 78,056 packed into the Sydney Cricket Ground to see St. George captain Norm Provan play his last NSWRFL game. It was also St. George's 10th straight premiership. 1966 - St. George win their 11th straight premiership, at the time a world record in any football code. 1969 - Balmain win a controversial grand final 11-2 over South Sydney. The game causes controversy due to Balmain's lay down tactics. 1975 - Eastern Suburbs beat St. George by a then record 38-0 score line. St. George fullback Graeme Langlands plays the game in white boots and has a painkiller injection go wrong. 1977 - St. George and Parramatta play out the first drawn grand final, 9-all after extra time. They come back the next week for a grand final replay and St. George win 22-0. 1978 - Manly and Cronulla play out the second drawn grand final, 11-all. There is no extra time and the replay is played on the following Tuesday, won by Manly 16-0. 1987 - Manly defeat Canberra 18-8 in the last grand final played at the Sydney Cricket Ground. 1989 - Known by many as the best grand final ever, Canberra come from 14-2 down to beat Balmain 19-14 in extra time. Canberra became the first team outside of NSW to win the competition. 1992 - The Brisbane Broncos defeat St. George 28-8 to become the first Queensland team to win the grand final. 1997 - Brisbane defeat Cronulla for their third premiership in the Super League grand final. This was the first night grand final, the first (and currently only) top level rugby league grand final to be played outside of Sydney before a record crowd for any sporting event in Queensland of 58,912. 1997 - Newcastle winger Darren Albert scores a try with six seconds left to deliver Newcastle their first ever premiership, 22-16 over Manly. 1999 - A world record crowd of 107,999 watch the two newest clubs Melbourne Storm and St George Illawarra Dragons battle it out. St. George Illawarra lead 18-14 before a late penalty try to Melbourne winger Craig Smith gives the Storm a 20-18 win to become the first Victorian team to win a NRL premiership and the quickest NRL club to win their first ever premiership in only their second season. 2001 - Newcastle win the first night grand final in Sydney, 30-24 over Parramatta. 2005 - Wests Tigers five-eighth Benji Marshall throws a magic flick pass to winger Pat Richards as the Tigers become the first joint venture to win the premiership, 30-16 over the North Queensland Cowboys. 2008 - Manly Warringah Sea Eagles secure a record 40-0 win over Melbourne Storm. 2014 - South Sydney Rabbitohs win their first premiership in 43 years, beating Canterbury-Bankstown Bulldogs 30-6. 2015 - The North Queensland Cowboys' first premiership after 21 seasons in the NRL and widely regarded as one of the all-time best (along with the Raiders' '89 win). The first all-Queensland NRL grand final sparked talk of future deciders being held in Queensland. It was also notable as Brisbane Broncos ended their biggest drought from a grand final since entering the competition (in 1988) and it was Bennett's first season back in Brisbane after leaving in 2008. North Queensland Cowboys winger Kyle Feldt scored a try from a Michael Morgan try-assist after the full-time siren to level the game at 16-all. After Jonathan Thurston missed the sideline conversion, hitting the right post, the match went to golden point extra time, the first grand final to do so. The Kyle Feldt kick-off to begin golden point was dropped by the Broncos' Ben Hunt. From the ensuing set of six, Thurston kicked the winning field goal, and was subsequently awarded the Clive Churchill Medal. It also ended Brisbane's undefeated streak in grand finals, having won all six previous deciders. 2016 - Cronulla-Sutherland Sharks win their first premiership in their 50th season by defeating Melbourne Storm 14-12. This was also only their 4th grand final appearance since entering the competition in 1967. Their other grand final appearances came in 1973, 1978 and 1997. The Sharks won only one of their final five regular-season games. But it was enough to break through for their inaugural premiership. 2017 - The Melbourne Storm won their third valid title, and will go down as one of the most dominant sides in Rugby League history after winning the minor premiership an premiership as well as having the best attack and defence of any team, finishing the season off with 23 wins and 4 losses. The 1999 NRL Grand Final saw a new rugby league world record crowd of 107,999 was at Stadium Australia for the game. The attendance, which saw 67,142 more people attend than had done so for the 1998 NRL Grand Final at the Sydney Football Stadium, broke the record attendance for a grand final, eclipsing the previous record of 78,065 set in 1965 when St. George defeated South Sydney 12-8 at the Sydney Cricket Ground. The 2014 NRL Grand Final had a crowd of 83,833 was the largest attendance at a sporting event at Stadium Australia since its 2001 reconfiguration. Early NRL grand finals featured a halftime show consisting of marching bands but as the popularity of the game increased, a trend where popular singers and musicians performed during its pre-game ceremonies and the halftime show, or simply sang the Advance Australia Fair, emerged. ^ "Aussie Stadium". Australian Stadiums. Retrieved 22 January 2007. ... however grand finals were transferred to the much larger Olympic Stadium at Homebush when it opened in 1999. ^ Australian Associated Press (8 June 2010). "NSW to retain NRL grand final". The Sydney Morning Herald. Retrieved 14 June 2010.